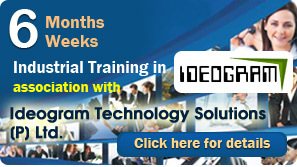 ActIT Technologies, a leading Software Training Institute in assoiciation with Ideogram Technology Solutions [P] Ltd, Leading Web and Software Development Company provides 6/8 Weeks and 6 Months Industrial Training to B.Tech. MCA BCA BE and other IT Students. ActIT Technologies will provide you an opportunity to work with the team of Software Developers of Ideogram Technology Solutions [P] Ltd under the guidance of Project Managers. The project based training includes both class room training and once you learn the language and database, you will put on the project. Our core focus is to make the students well verse with the different cycles of Software Development and to provide them hand on experience on Live Projects. The Course Covers Technologies like C#, VB.NET, Visual C#.NET, ADO.NET, ASP.NET, HTML, Web Page Designing, IIS Management, Server Management & Configuration, Remote File Uploading, FTP, Installer & Package Creation, Auto Run and SQL Server 2005 Database Management among others. Each student enrolling for this course will be provided with Domain and Web Hosting so that they can host the Dynamic Web Application on that particular domain and showcase the website in their Resume. The course revolves round Developing Highly attractive and Dynamic web Applications with PHP and MySQL. This course also covers Web Designing using HTML/DHTML, CSS, Java Script, JQuery and Flash Animation. The course also covers WordPress (PHP Based Content Mangement Solutions) and and Tomatocart(PHP Based ECommerce Solution) among others.